In Grace Annear’s world, seconds matter. A thousand one… a thousand two. As advanced as the workouts, technical training, science, physio and nutritional data are in the universe of elite athletics, the end game gets simple, quick: if Annear can shave two seconds off her personal-best time, then this 800-metre specialist from Hampton has a real shot at representing Canada at the IAAF World Track and Field Championships, slated for Aug. 4 to 13 in London, England. For the record, she owns a PB of 2:03.3 and must clock 2:01, or better, by the time the national championships ends their early-July run in Ottawa. While it’s possible the standard could be achieved at the meet, Annear is taking a pragmatic approach to the task at hand. While the world championship is the lead item on Annear’s bucket list for 2017, there are other options for top-calibre competition. The 24-year-old has already qualified for Team New Brunswick’s entry to the eighth Jeux de la Francophonie, set for July 21 to 30 at Abidjan, Ivory Coast. She could also be part of Canada’s contingent for the FISU World University Games, which run its course fromAug. 19-30 in Taipei, Taiwan. To know Annear is to understand her passion for excellence, whether she’s pursuing athletic goals or drawing on the creative side of life. 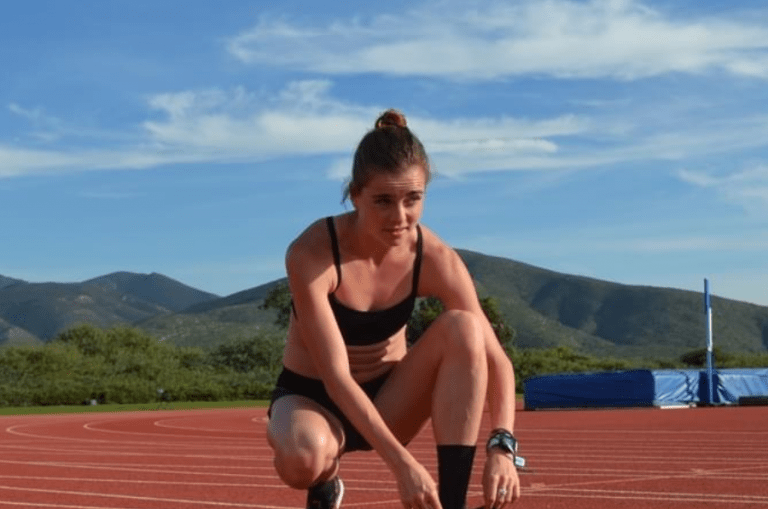 With a Masters in Creating Writing, she blogs about The Adventures of Sarah and Grace on the Athletics New Brunswick website, offering a narrative about life as elite middle distance runners (in this case, herself and Fredericton’s Sarah McPherson). And, she welcomes the opportunity to give a shout out to Dr. Erik Klein and the great folks at The Town Chiropractor; afterall, says Grace, by treating her injuries over the years and assisting financially, they have played a rather significant role in helping turn an opportunity to pursue her athletic dreams into a reality. • A 2:41.22 clocking over 1,000 metres at the UW Open in Seattle – the second-fastest time by a Canadian in 2017 and the seventh-fastest time, ever, by a Canadian. There are lots and lots of provincial records and meet victories and… well, you get the idea: this future law student belongs on the track. In her continuing pursuit of excellence, she has returned to her old collegiate stomping grounds of Victoria – you see, Annear took a leap of faith in January and joined Athletics Canada’s West Hub training centre and under a program called NextGen, which takes its athletes to warm-weather and altitude training camps and to major meets across North America. “I moved back to probably the best training environment in Canada,” said Annear, “and was immediately blown away by the support. I’m being coached by the outstanding Heather Hennigar. I have an incredible group of training partners. I have so many resources that are going to make this next leap possible. Everything I think I need, and more, they have. If I am going to do it, it’s going to be in the situation that I’m at right now. As the conversation continues, Annear dives into the world of high-performance training. Take, for instance, the emphasis the program places on form and technique. “It wasn’t really something that I practiced during my undergrad,” said Annear. “When I came back, and because I had so many injuries, I was very careful about form and technique; I bought textbooks on anatomy and studied how my body should be moving so I could prevent injuries. There was a time when Annear never imagined the possibilities that are now before her this summer… a time when her track career was over.